Detective Kim Stone is on her seventh outing in this up to the minute series by author Angela Marsons. 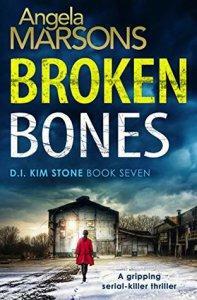 Broken Bones opens at Christmas time with an abandoned baby outside the police station. The infant is well dressed three month old and has clearly been cared for, so why has it been left on a cold winter’s night? Kim Stone is at a complete loss what to do with the small infant but fortunately others within the station have a few more nurturing instincts than Kim and the baby is looked after while they wait for social services to take ownership. The same night the body of a murdered prostitute is found and an investigation launched to find the perpetrator. Angela Marsons has a knack of simplifying what is actually two simultaneous complex investigations making this book immensely readable and providing that ‘I must just read one more chapter feeling’ with ease. As expected there are a fair few red herrings with a large cast of characters to keep the reader entertained as we follow Kim down some blind alleys. In many book reviews a large cast could be interpreted as you’ll never know who is who unless you take careful notes but not here. All of the characters are memorable starting of course with the sharp lead, Kim Stone and her side-kick Bryant – the banter between these two lightening the mood to avoid the book falling into a miserable read. As there are two different investigations the team are split up with Stacey getting to emerge from behind her desk to partner with Dawson as she takes her investigative skills out into the wild. The reader follows both sets of pairs along the way which really underlines the importance of the entire team with the focus not solely on our lead character. That said Kim is still as feisty and as driven as she has been in the previous books in this series which makes her one of my favorite detectives on the contemporary scene. When I mentioned that this is crime fiction with its finger on the pulse I mean not only that it accurately takes those stories that make the headlines and puts flesh on the bones to digest, the author also emphasises through Kim as her mouthpiece that the victims are people too. The prostitute isn’t shorthand for a victim that no-one cares about and by association, doesn’t deserve the reader’s sympathy but a woman who perhaps has had to make choices that none of us would want to. In short the books are full of the details behind the headlines, yes of course they are entertainment but they also make you think without the ‘issue’ ever overpowering the storyline. So we have an interesting premise (or two) a superb cast of characters from all walks of life but it seems to me that with each book Angela Marsons’ handling of the plot becomes ever more assured. There is no down-time in this book at all, I constantly needed to know what was going to happen next with the timing absolutely spot-on. In short, this is not a book to be missed by fans of the series and if you haven’t started this one yet, I’d get your skates on – book eight is due out in May 2018. Broken Bones was my eleventh book of the year for my Mount TBR Challenge 2018, having been bought in November 2017 and as it is my own copy, it is worth another third of a book token so once again I have one book in the bank! !